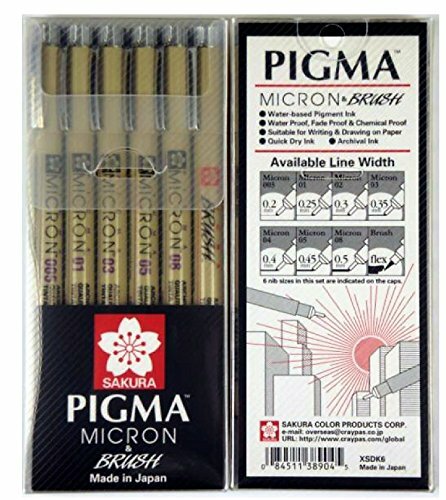 The need for accuracy, minute details and preservation count, the unparalleled archival quality of Pigma Micron pens makes them everyone's first choice. Artist, writers and illustrators reach for Pigma Micron and know their work is safeguarded with the permanence of Pigma ink. Used by technical professionals, artists and crafters alike - anthropologists, entomologists, scientists, research laboratories, archivists, architects, professional diamond cutters, cartoonists, manga and anime artists, illustrators, heirloom quilters and decorative fabric artists. Features archival quality ink for use in acid-free environments. If you have any questions about this product by Sakura, contact us by completing and submitting the form below. If you are looking for a specif part number, please include it with your message.